The Legal Genealogist is back in the air this morning, this time sadly winging westward towards Chicago. There, tomorrow, in the Lutheran church where he was baptized and confirmed, we will celebrate the life of Timothy Evan Geissler (1973-2017) — and mourn his loss. He will be laid to rest with his great grandparents and other kin privately on Monday. 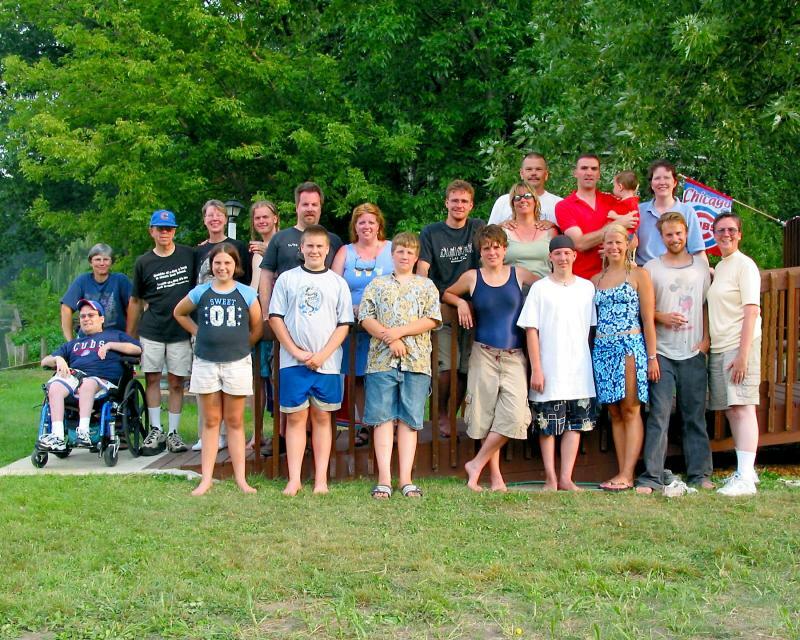 That’s Tim there in this family photo from a reunion in 2002. The one on the left, in the wheelchair. It’s what so many people noticed about him first. His physical limitations. But that’s not what we saw when we looked at Tim. We saw that impish smile. We saw the card sharp. You never ever ever wanted to play cards with that boy and put up more than you could afford to lose. We saw a sense of humor that had no bounds. We saw the loving son and brother and uncle. We saw the nephew and cousin … and the friend. We saw the heart and soul. We saw the shining spirit that was Tim. Rest in peace, beloved nephew. So sorry for you and your family’s loss of such a special person. Your writings about him always made me smile. Consider this a virtual hug! Some days are just too heartbreaking for words! Your eulogy for Tim brought tears to my eyes. In a small way, I mourn your loss, but know you all will celebrate the many ways he brought joy to your lives and brightened your days with him. I wish him wings. Thanks so much. Tim was so very special. Thank you so much for sharing this tribute to your nephew. So sorry for your loss, but what a beautiful way to honor who he was. I have a special needs son who sometimes is only seen as Autistic…but, as you’ve so lovingly shown about Tim, is so much more than a label…or a chair. May the Lord bless you and your extended family as you celebrate Tim’s life, mourn his loss, and share his legacy. Judy, So sorry for your and your family’s loss. I hope the joyful memories will live on and his spirit will continue to inspire and comfort all of you. I am so sorry for your loss. May he rest in peace, and may his family find peace in your memories.